Joining video calls can be a pain — at Daily.co we understand and are solving for this. Meeting links can easily be lost, people often join the wrong link or don’t know which link to join, tools require certain browsers, and so on. As a team we are constantly dog-fooding our product and we, too, run into real-world issues like these. Calls on mobile phones are even more of a pain point. Users are distracted by notifications, messages, small screens, etc. In short, it can be tough to join a call on a phone. And yet, mobile phones are ubiquitous in the modern workforce. As the Design Lead for Daily.co, my job is to help remove these pain points where we can and when it makes sense for our business. We are a small, distributed team, so anything we can spearhead, individually, is beneficial to our mission. I also find it fun to experiment with new technologies. So to spill the beans, here’s a preview of what we built — using Apple's new Shortcuts app — to make joining Daily.co calls on your iOS devices even more seamless. I’ll dive into more detail below or you can get the shortcut for yourself here. Daily.co is built and designed on top of modern web technologies. This allows us to build powerful video calling features for the widest possible audience. With the release of WebRTC on Safari, we now support video calls on even more browsers; from Safari on Mac and iOS, to Edge and so on. See all of the browsers we support here. Just note that support for browsers — other than Chrome — is experimental. Google has been very active in supporting WebRTC, which is why we supported Chrome from our first Daily.co launch (it has more features, like recording). Still, we’re pleased to bring our product to people who prefer solutions other than Chrome. It’s especially powerful to have a Daily.co video call directly inside of Safari on your iPhone or iPad. We will soon support embedded calls via our API, more on that soon. While we are limited by what we can do as a web based product, we still want to remove that limitation and design a richer, more native experience for iOS clients, hence iOS Shortcuts. The prevalence of voice-activated AI — much like video calling — has opened the door to many new design challenges and opportunities. Amazon Alexa, Google Assistant, and Apple’s Siri have changed the way we interact with our devices and move throughout our days. Users can maximize the benefit of Shortcuts even further by dictating custom Siri phrases. Example of adding a phrase to Siri in the Shortcuts app. The added benefit of Shortcuts is that they will run on all of your iOS devices instantaneously. For example, if I add a Siri phrase, I can run a shortcut by dictating to a HomePod, Apple Watch or iPhone. We are constantly thinking of new ways to make using Daily.co simpler and more user friendly. As stated above, joining a call has historically been one of the key points of friction for video conferencing. We’ve actually redesigned our join flow a couple of times already, yet historically we’ve focused on the experience of joining from a computer, not a mobile device. Due to OS-level constraints, you must use Safari. Third-party browsers like Chrome or web views will not work. But perhaps more importantly the context in which our users find themselves joining calls on mobile devices is often in a distracting environment; like while commuting to the office, driving, or in a busy park. The proliferation of artificial intelligence means that we are entering a device agnostic world. Users should — and to some extent do — expect for their tools to work regardless of their environment. Time is precious when you’re joining an important call and at Daily.co we want to soften these contextual edge cases as often as possible. Currently, we’ve opted not to ship — or require — an iOS app to join calls. Rather we’ve elected to remove the friction that comes from installing a new app by supporting calls in Safari. There are certainly a trade-offs to this approach; while apps are a pain to install, a self-contained app can streamline other parts of the user experience. Shortcuts enables us to perform actions across apps. 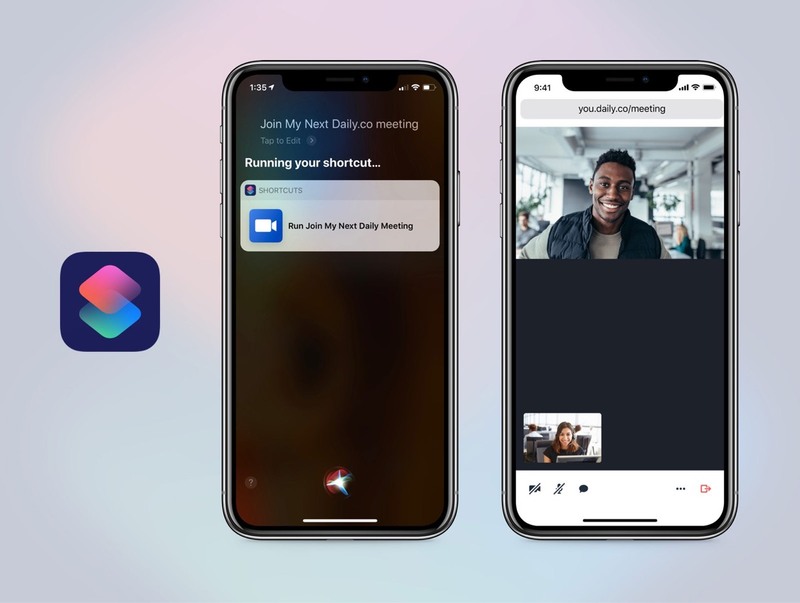 Given the limitations of our web-based technology stack, Shortcuts seemed like a fun way to see if we could make joining a Daily.co call easier and more native, and we think we have a neat solution. In the simplest terms, we designed our Siri Shortcut to search the default Calendar app for your next upcoming Daily.co event. It then looks for URLs and will open a URL in Safari. To cover gaps in the UX, the shortcut will display a message if no URLs are found, or it will ask you to choose a URL if multiple are returned. Get our Siri Shortcut here. Here’s a screencast of the actions we strung together to create our Shortcut. You must use the default Apple Calendar app — unfortunately we haven’t found any third-party calendar apps that will work. If you are able to get this working with Fantastical, Google Calendar, etc., we'd love to hear from you! The shortcut will return links it finds in an upcoming event. For example, email addresses or help links may be returned should any be found in your event. You can choose which calendar to search. Daily.co meeting links are opened in Safari. When the link loads you'll choose how you’d like to join the call: on your phone, via a Daily.co TV or by dialing-in. Choose a default calendar upon install (for example, I use my work calendar). Add a Siri Phrase. Tap the toggle icon (on the top right of your screen), see Apple's support article. Designing this Shortcut was a lot of fun. Admittedly, as an Apple user I had fun toying around with it. Once you install the Shortcut it will propagate out to all of your iOS-based devices. It will be interesting to see more functionality come to the Shortcuts app in the future, keep an eye out for more updates. And, look forward to a similar post for Android users! TL:DR We made a Shortcut for iOS, get it here.